"Wee Pals" Quilt kit to create a 30.5" x 40.5" baby/ children's quilt, featuring the whimsical "Hello World, Good Day!" fabrics by Cori Dantini for Blend Fabrics. 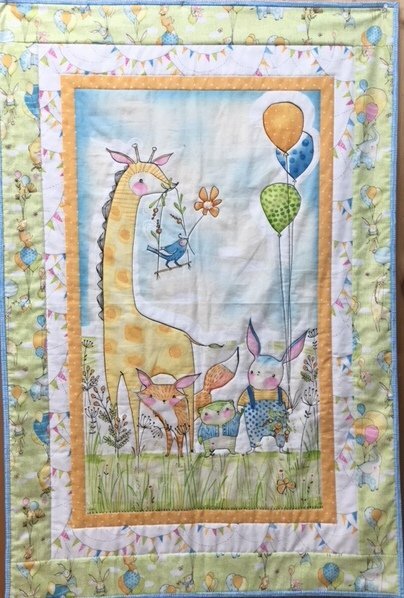 Giraffe, balloons, fox, bunny, hedgehog and bird all greeting your wee one to the world. Quilt design by Blend Fabrics. Includes fabric panel + fabrics to create the top, plus fabric for binding. Backing fabric included. Instructions included. Skill level - Beginner.